a unique, magical, sustainable piece of coastal California. For generations, families and friends have continued to enjoy the fondest and most loving memories shared at this magical Gaviota Coast Ranch. Priced at $1,795,000. It is now time for the next land custodians of this legacy mountaintop property to discover its timelessness. The property is located approximately 5.6 miles up from Refugio State Beach, on the Pacific side of the Santa Ynez Mountain range. Perched at approximately 1,500 feet, this property often sits above the fog line with a heaven-like panoramic view from Ventura to Gaviota. Leaving the hustle and bustle of Southern California behind, turn off the 101 freeway and allow yourself to slow down and enjoy the meandering road that leads you past creeks, lemon and avocado orchards and rolling hills and up to forever views of the entire Gaviota Coast. Turn off the paved road, pass through the semi-private, solar powered gate and wind your way through meadows and past the pond, under the watchful eye of the wind generator and take a deep breath- welcome home. As the driveway ends be prepared to have your breath taken away by the immediate and extraordinary view, then breathing deeply again, take in the plentiful natural surroundings, well-loved trails and mature oak tree meadows. As you notice the lichen covered boulders and seasonal creeks, you are now becoming a part of the continuum of people who have known this place for well over four thousand years. Within a stone throw of where you stand there are remains of ancient Chumash collection sites; foundations of early Adobe homes from the stone cutters who lived here at the turn of the century; and, 100 year old olive trees that were brought from Spain around the tip of South America to outline the original road to the property. This property is a cherished piece of history, genuinely one of a kind! In addition to the natural elements, you will notice several structures that have been thoughtfully designed, with time and great consideration given to the lay of the land. The main house, architecturally designed by Frank Lloyd Wright disciple, Donald Hoppen, is virtually invisible from the sky or the approaching road. With contemporary and unique design elements the home was modeled after the radials reminiscent of a nautilus shell. One moves through the rooms of the house as you would move through chambers, the radial curves allowing one to flow from one room to another with ease. The angle of the house reflects the angle of the mountain range; the curve of the front of the house is identical to the contour lines of the site; the “point” of the house is like the bow of a ship, and the roof of the house is planted in native grasses and wild flowers, so it perfectly blends into its surroundings at all times of the year. The overhang of the eaves allow the sun to enter far back into the living room during the winter months, warming the interior. During the summer months, the sun barely touches the interior, keeping the house 10 degrees cooler than the exterior, without the need of air conditioning. At approximately 2,400 square feet this green home was thoughtfully designed around its surroundings. Built with impressive 50 foot long 12’ x 12’ main beams recycled from the old Refugio Bridge, which now shore up the nearly 30,000 pound sod roof. 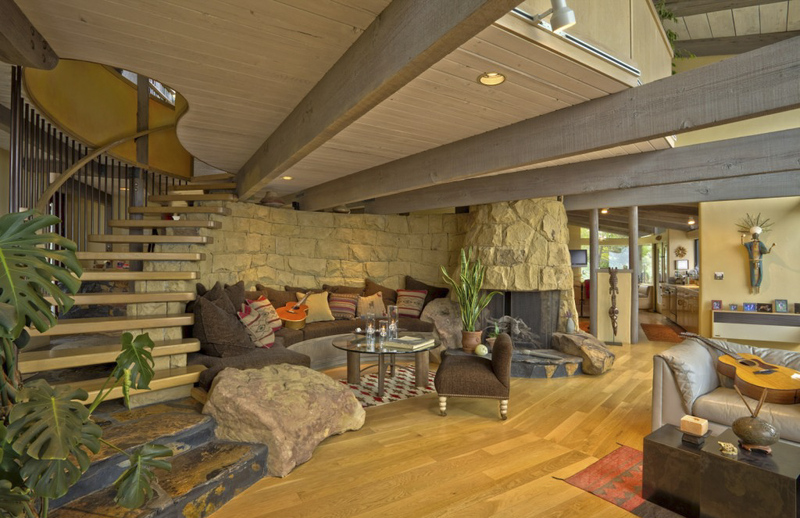 Be taken aback by the beautiful sandstone walls cordoning the driveway, and the beautiful living room wall, with mortar-less joints and massive lichen covered boulders that define the sandstone fireplace, all quarried by loving hands from the land itself. A wrap-around first growth redwood deck, is outfitted with perfectly placed sky chairs to view the marvelous sunsets, the Milky-Way Galaxy, shooting stars and meteor showers. The floor to ceiling glass windows lend themselves to a feeling of lightness and surreal views of the whole coastline and four of the Channel Islands. The floors on the main level are slate from Yosemite and white oak. The cantilevered circular stairs are a work of art, with steps that are a hand laminated combination of oak, olive and walnut, with a curving redwood banister. The acoustics generated by this structural design are simply superb. There are two levels upstairs- one with the commanding views in the master bedroom and an additional level sits at the top of the home, currently being utilized as a den/office/library. Beneath the house is a finished nearly 300 square foot basement, presently being used as an office. There are original plans for two additional bedrooms, one bathroom and a garage. Surrounding the house is a hot tub, a hillside recently planted in Haas avocados, a horseshoe/bocce court and numerous areas for gardening, with drip irrigation throughout the property. 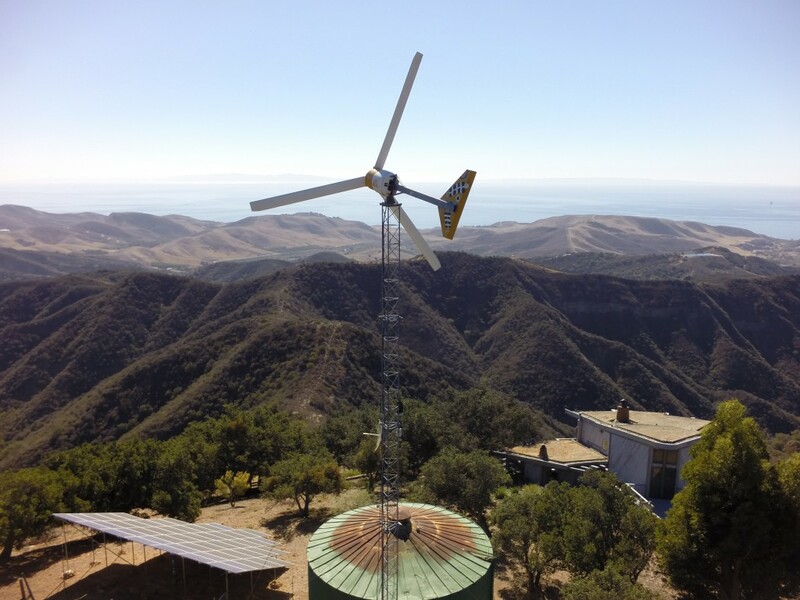 Located on the hill, at the highest point of the property is a 10-kilowatt Bergey Wind generator, with 24 foot blades, that is installed 60 feet above ground. This “alternative” power source provides approximately 90% of the yearly electrical needs for the whole property. At the base of this impressive unit are 50 passive solar panels. Any additional power not used on the property runs the meter backwards, essentially creating an annual “credit” with Southern California Edison. All electrical lines are buried out of sight. A 20-kilowatt propane powered generator serves as an emergency backup power source for the entire property. A grove of strategically placed eucalyptus trees at the base of the wind generator serve to lift the wind up and over the house, protecting the physical structure. Water is an abundant resource on this land with several sources including a 500,000 gallon lined pond, a 500+ foot deep well, a 30,000 gallon cistern, as well as multiple storage tanks (50,000 and a 10,000 tank strategically placed around the land) all serve to support and protect the property. All the water storage systems are connected with a 2 inch main buried 4 feet deep, with hydrants strategically placed along the road for access. Motion sensor lights illuminate the sandstone walls that lead around the driveway, which carefully avoided the necessity of removing any of the ancient oaks. A 20 x 60 foot green house, once home to Santa Barbara Heirloom Nursery, is located near the well. There is also a guesthouse and a shop plus a separate and newly refurbished art studio/office along with a unique 1/4 mile long mountain bike trail complete with jumps and curves that drop down around massive boulders, under the oaks. The main meadow and area around the house is completely fenced. To experience this property is to believe in what has been, and what can be for future generations. This is a once in a life time opportunity to live above the hurried movements of “town” and become the next land stewards who will appreciate, cherish and respect the history of the area and the stunning natural elements. The “Shire” is a unique, magical, sustainable and true piece of coastal California. Use less. Live more. If you have any questions or would like to set up an appointment to view the property, please don’t hesitate to contact me via the button below.